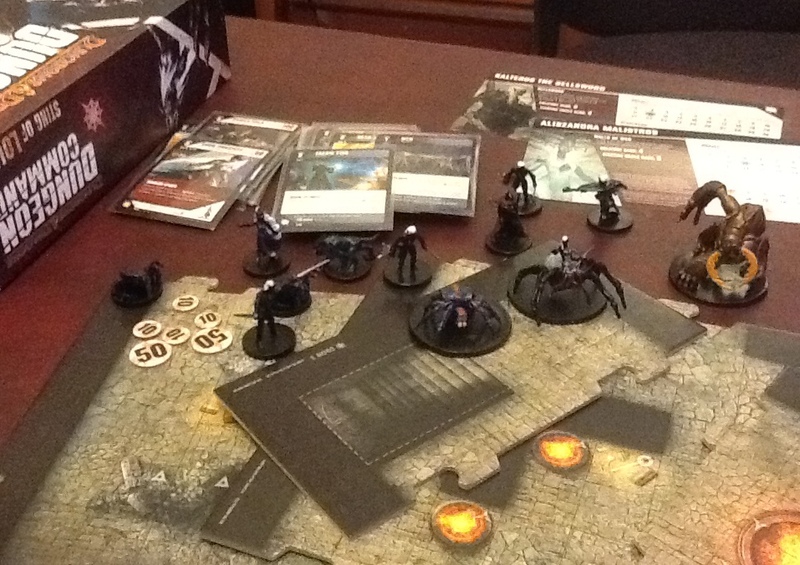 One of the big new games we came home with from Gencon was Dungeon Command. My kiddo was obsessed with getting it after seeing one of the sets was Drow-themed (I'm beginning to think he's RA Salvatore's number one fan amongst 10 year olds), and after getting in a handful of games with the system, I can heartily endorse it. 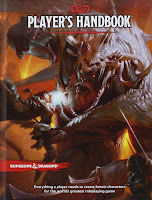 Most of my reviews are RPG books, but this has enough nexus with D&D, Wizards of the Coast, and gaming, such that I don't mind stretching the bounds. In Dungeon Command, you play out a miniatures battle on a board made out of dungeon tiles, snapped together like puzzle pieces. There are configurations for 2, 3, and 4 player games, although each player needs their own tile set and figures. Game play mixes traditional D&D miniatures style combat with a card mechanic reminiscent of Magic: The Gathering. The whole is greater than the parts. As a player, you take on the role of a battlefield leader, and each set gives you a choice of two personae from which to choose. The leader cards govern things like creatures in hand, life (morale), mana (leadership ability), and each has other special abilities that modify game play. Creatures are represented by D&D minis, with stats on creature cards. Special game play effects are managed by "Order Cards' drawn from an Order deck. There is a tapping mechanic for attacking or using special abilities granted by the cards. The game has a compelling mix of physical bits that make it part board game, part card game, and part minis game. As I said, the battlefield is built from a mix of tiles provided by each player, giving you some control over the placement of terrain and obstacles. "Treasure chest" are seeded on the battlefield, and they can be used by creatures to heal the player's life (morale) in lieu of attacking. Creatures have resource costs that limit how many can be in play at a time. Cards are another expendable resource that can let creatures attack multiple times, do extra damage, dodge attacks, or perform spell-like effects. There's a system of key words that govern which creatures can perform actions with the cards; fighters can't use spell-like cards, for instance. Various well-known D&D spells and magic items look like they'll be making appearances as cards; Potion of Healing is a minor effect that heals a creature's life; Fireball is a standard attack card that can be cast by an Int-based creature (like the War Mage or Copper Dragon in the Cormyr set); Faerie Fire is an enchantment-type card the Drow can attach to an enemy, making that creature more vulnerable to attacks. 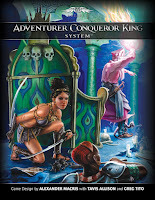 Dungeon Command was released in late July with two initial sets - Sting of Lolth, a Drow-themed set, and Heart of Cormyr, knights, dwarves, and mages. I don't pay close attention to WOTC releases these days so this one flew under my radar. 5th Edition isn't supposed to be out until 2014, after all, so there are still a wide range of outcomes for that particular project. In the meantime, here's Dungeon Command, mining the D&D brand and product identity, as well as WOTC's deep in-house expertise on card games, to build a really great game. There are upcoming releases planned for September and November; a goblin-themed seat featuring a troll as the big monster, and an undead-themed set featuring a dracolich. One of the best parts: the game is non-collectible. There's no headache around random booster packs of cards or miniatures. Every set is a fixed roster of cards and figures. If you like both D&D minis and card games, this is a can't miss game for you. The cards and special abilities add a dramatic amount of strategy and ensure a high replay value. Traditional war gamers may not enjoy the randomness and surprise created by the card mechanic; well-planned attacks can be foiled by counter cards that block damage, like a magic user's Shield spell. If you were a heavy collector of D&D miniatures from some of the previous incarnations of the line, you probably have all the figure sculpts already; WOTC is using existing molds to fill out the new game. 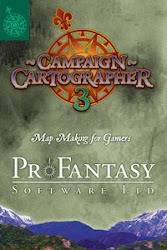 Like I said, this is a clever product to fill the gap between now and 5E, since it leverages previous R&D dollars from the minis game, leverages the D&D brand for concepts, and pulls in expertise from the M:TG side of the house. It's shrewd business. The game offers no insight to me whether 5E will be good or bad; it does demonstrate that the designers at WOTC can still make really fun games. This is a bit of a premium product; a single set of Dungeon Command sells for $26-$30 online, or msrp $40 if you're lucky enough to still have a brick-and-mortar game store in your area. Any questions, fire away in the comments!